Interested in volunteer, internship or employment opportunities at Fort Riley? Do you enjoy working with children? The Institute for the Health and Security of Military Families is collaborating with Fort Riley Child & Youth Services to host Q-and-A sessions from 11 a.m. to 1 p.m. Wednesday, Feb. 1, March 1 and April 5, in 245 Justin Hall. Information will be provided about how to apply for current job openings on usajobs.gov, as well as how to complete volunteer and background check paperwork. Anyone attending is asked to bring their laptop and current resume, transcript and references all in a PDF file format. 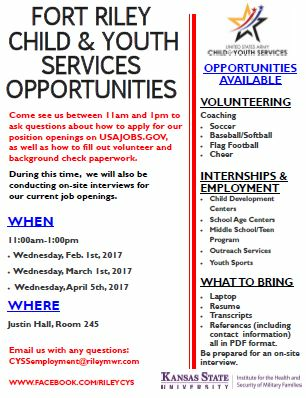 On-site interviews for current job openings within Fort Riley Child Youth and School Services also will take place at this time. Contact CYSSemployment@rileymwr.com for more information.